Hirokazu Koreeda’s effort to stray away from the various versions of the family drama, was, once again, crowned with success, winning most of the major awards from the Japanese Academy (Picture of the Year, Director, Screenplay and Film editing) along with ones for Supporting Actor and Actress. Shigemori and his law firm have been assigned to defend Misumi, a fired factory worker who has confessed to killing his former boss. Between the confession and Misumi’s former convictions, this seems a fairly cut-and-dry case for the defense team, whose job, as expected by the legal profession, is simply to reduce the charges and avoid the maximum punishment of the death penalty. But Shigemori starts detecting holes in Misumi’s statements, which have the unfortunate effect of both undermining the defendant’s credibility while raising doubts about his guilt. Is Shigemori’s only recourse to continue down the pragmatic line of “good legal strategy”? Or must he sink into the murky waters of truth and justice? When the wife and the daughter of the victim also get involved, a number of secrets are revealed and the case becomes even more complicated. I have to admit, although Koreeda has perfected the style of the Japanese family drama, I found that he was repeating himself in his last movies. Thus, this turn to a different theme, genre, and even format since “The Third Murder” is shot in Cinemascope, which he has not used before, is more than welcome. In terms of story and narrative, Koreeda implements a tactic that is quite common in Japan and Korea, but not in the rest of the world, where the perpetrator is known from the beginning, and the protagonists struggle to find the why and the how. Through this concept, he implements his thoughts on a number of subjects, with the central theme being the difference between justice as a concept (the way people perceive it) and justice in its implementation in the court, which is something completely different. Shigemori represents the second one quite eloquently, as his focus lies exclusively on his client and how to minimize his sentence, without giving any regards to “actual” justice. On the other side of the axis stands Misumi, who seems not to give any kind of regards to the judiciary justice, while he is willing to go to extremes to apply his own. On a secondary level, the second part is also presented by Kawashima, a young assistant in Shigemori’s office, who finds it very hard to cope with his senior’s cynicism (pragmatism if you will), in idealistic fashion. Shigemory seems confident and very sure of himself and his role as a lawyer, but, through his interaction with Misumi, finds himself changing, and instead of simply trying to win a case (which actually serves him as much as it does his client), eventually becomes interested (obsessed even) with finding the truth. 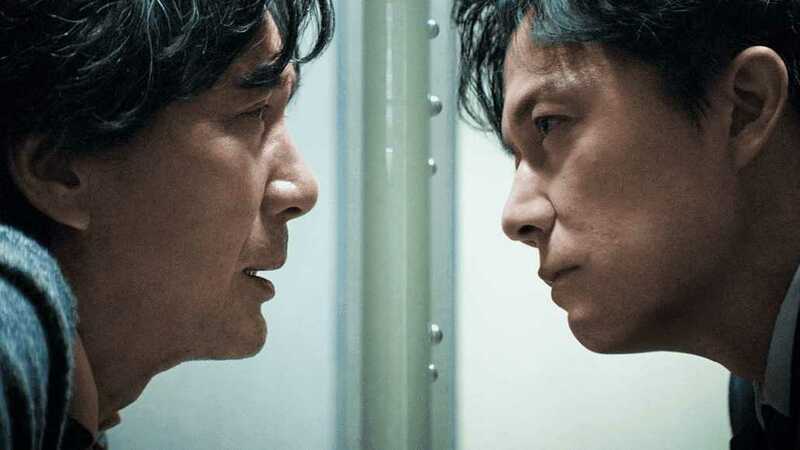 These changes, and the many one-on-ones between the two men are the most impressive aspects of the story and the narrative, with Masaharu Fukuyama as Shigemori and Koji Yakusho as Misumi highlighting both their prowess in portraying their parts and their chemistry. At the same time, Mikiya Takimoto’s cinematography finds its apogee in these scenes, which feature exceptional framing. One of the most recognizable traits in Koreeda’s filmography is his attention to detail, and the particular movie is not an exception, as the various sequences in the court and the way all members of the judiciary conduct themselves is utterly realistic. In order to present such accuracy, Koreeda brought together seven lawyers over several months to stage mock trials and mock interviews of a criminal while he was taking note of their language and thought process. Of course, with his background, the film could not but feature some elements of family drama, which are mostly presented by Fukuyama’s relationship with his daughter and by Misumi’s with the deceased’s daughter, Sakie. However, this aspect is placed on the background, despite the fact that eventually functions as a catalyst to the story, and by no means does it dominate the film. Nevertheless, Suzu Hirose does an exceptional job as the latter, with her constant limp and quite eerie attitude being one of the best aspects of the production. Koreeda’s own editing induces the film with a pace that is relatively slow, but quite faster than his usual one, which definitely makes the movie easier to watch. Yohei Tanada’s production design is also great, as he portrays different sets (the “maximalism” of the office and the “minimalism” of the various houses) with artistry and accuracy. Lastly, Ludovico Einauid’s music compliments the various scenes wonderfully, with the ones in the snow standing apart. Evidently, Koreeda has not perfected the trial thriller with existential implications as much as he has done the family drama. However, “The Third Murder” is still a great film and a nice change of pace for the Japanese filmmaker, and at the same time, a much more approachable spectacle, which will definitely be more appealing to occidental audiences, even fans of the mainstream.